Whether you’re trying to avoid eye contact with other diners or just can’t stand to stop watching cat videos long enough to slurp down some lunch, there are plenty of reasons to use your iPhone while you’re eating. 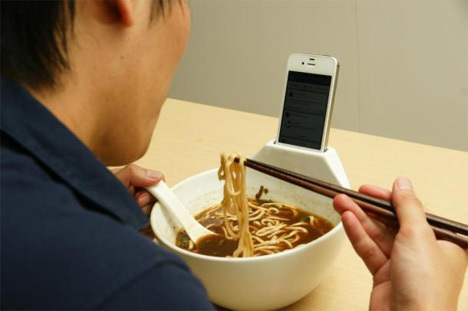 But because it’s not always possible to prop your phone up and eat at the same time, the Anti-Loneliness Ramen Bowl is now a thing. The bowl, from MisoSoupDesign, is perfect for holding noodles and incorporates a slot on one side that’s the perfect size to hold your iPhone. Is it a fantastic idea to have your expensive phone so close to a bowl full of wet noodles? Maybe not so much, but with the addition of a sturdy screen protector the bowl can make mealtime a lot more fun. 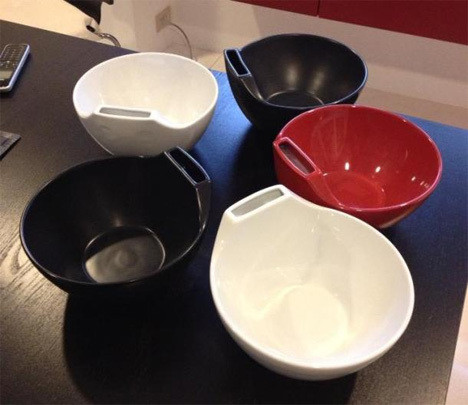 After the food is gone, you can even use the empty bowl as a kind of amplifying speaker for your phone. The Anti-Loneliness Ramen Bowl isn’t for sale just yet, but MisoSoupDesign says that the product will be available to order soon.